There has been a significant transition towards industrial Ethernet networks over the past few years with large vendors making an aggressive push to swap existing fieldbus infrastructure for Ethernet-based technologies. The promise of Industry 4.0 and the IIoT is that they can harness this shift, along with the global connectivity platform of the Internet, and recent IP stack extensions such as Time Sensitive Networking (TSN), to enable organisations to establish operational efficiencies and supply chain optimisations not previously achievable. However, many industry pundits acknowledge that fulfilment of this promise will take time and considerable investment and understanding of the myriad of dynamic interdependencies that make implementation complex. The disparate levels of digital maturity of people and processes further exacerbate the challenge. There is still a need to identify and address the issues that cripple continuous improvement – often there is a simple answer waiting to be unravelled. Yes, the 80/20 rule still applies, so identify the low hanging fruit and take advantage of the same underlying technology improvements that will support Industry 4.0. Rather than try and get ‘there’ in a single leap of optimism, there are many intermediate steps and knowledge acquisition and preparation that can be undertaken to enable the transition to take place with value being realised each step of the way. Vendors, wanting customers to adopt their latest offering, often motivate for a complete upgrade – out with the old and in with the new. While the cost of installing a new industrial Ethernet system does not vary greatly from installing a modern fieldbus network, the cost of replacing a fully functional fieldbus with a newer technology is a significant cost. This comes as both an upfront capital cost (purchase modern technology, system design, installation and commissioning time) and operational cost (extensive initial downtime and production loss, and the need for training). Improved operations over time hopefully mitigate this investment. 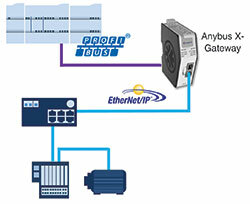 Gateway linking Ethernet/IP I/O devices to an existing Profibus PLC. Operators of manufacturing facilities, while desiring improved operations, also need to sweat their existing assets and try to reach their design life of 20 to 50 years, without being drawn into making such major changes that introduce capital cost and impact production availability. The ability to migrate slowly over time, blending modern technology with legacy components should be an attractive compromise. Rather then, as networks reach end of life, and budget is made available, plants could opt to upgrade small portions of the entire network and maintain communication between the different systems with the use of gateways and protocol converters. This allows a more manageable transition with the advantage of keeping operations largely unaffected. Consider the case where the actuators and sensors are the first to be upgraded on a network and the existing PLC/DCS system is to remain running the plant. Without having to migrate or renew the controller’s logic, users can integrate a gateway device to transfer I/O from upgraded sensors and actuators. 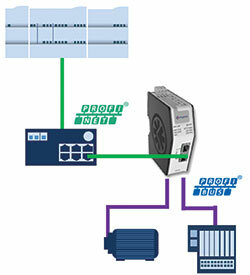 In this scenario, the gateway acts as an Ethernet/IP scanner and cyclically transfers data from connect I/O to the Profibus PLC. Gateway linking existing Profibus I/O devices to a Profinet controller. A second scenario is where the control system can be upgraded to a newer technology while the existing field infrastructure remains intact, especially expensive components like drives and process analysers. For example, Profinet and Profibus, the gateway in this scenario will act as a Profibus master, scan the configured I/O from each of the devices connected and in turn make this available for the ‘new’ Profinet PLC system. It is certainly no secret that there is an engineering skills shortage across all industries, and this is especially true with respect to automation systems based on modern communication technologies. It is becoming more and more challenging to have staff at remote facilities all trained and experienced on both legacy and modern technology. While it remains true that relevant and effective training on these technologies by site staff is still a key operational component, it is now possible to supplement these local skills with insight and expertise from elsewhere. It is possible to establish secure remote access to site information that provides real-time performance metrics for networks, equipment, production output and quality, such that a pool of human expertise, along with machine learning and other artificial intelligent tools can be applied against similar plants geographically dispersed around the world. Proactive and reactive intervention can be triggered almost immediately without the time delay, health/safety risks and costs of travel to these locations. The use of IIoT edge devices, OPC-UA, MQTT, FDI/FDT and other software tools enables a geographically-displaced community to effectively collaborate and share information and experience and further justify the continuing adoption of tools and methodologies that bring Industry 4.0 closer to realisation. • Keep sweating plant assets and blend legacy automation components with modern industrial Ethernet systems at a pace that makes sense. • Make use of secure remote access and site monitoring tools to allow rapid response by outside expertise to site issues that affect equipment availability, production efficiency, product quality and personal safety. Is HART technology still useful as manufacturing moves to Industry 4.0? Time savings of up to 60%. Bring serial interfaces into the era of Industry 4.0.